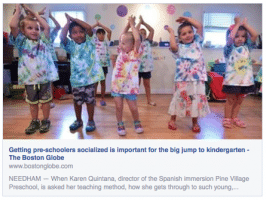 We were so excited to be part of the August 24, 2014 Boston Globe feature article, “Road To Kindergarten More Than Child’s Play” (see the Globe website for the full article), and now for co-founders Brid Martin and Emma LaVecchia to be on old friend and colleague Jeffrey Davis’ radio show for entrepreneurs. The show provides advice, information and connections for entrepreneurs, service providers and established companies, and their episode aired on the Radio Entrepreneurs Network on Thursday, September 18th. Even though the episode aired last week, you can still listen online at RadioEntrepreneurs.com or on Tune-In. You can also listen on your mobile device by downloading the Radio Entrepreneurs app. (See the links below or search for Radio Entrepreneurs Network in your app store.) Listen to their story, get the inside scoop on their experience starting out as fledgling business owners and most importantly. . . how they made it work! Let us know what you think!